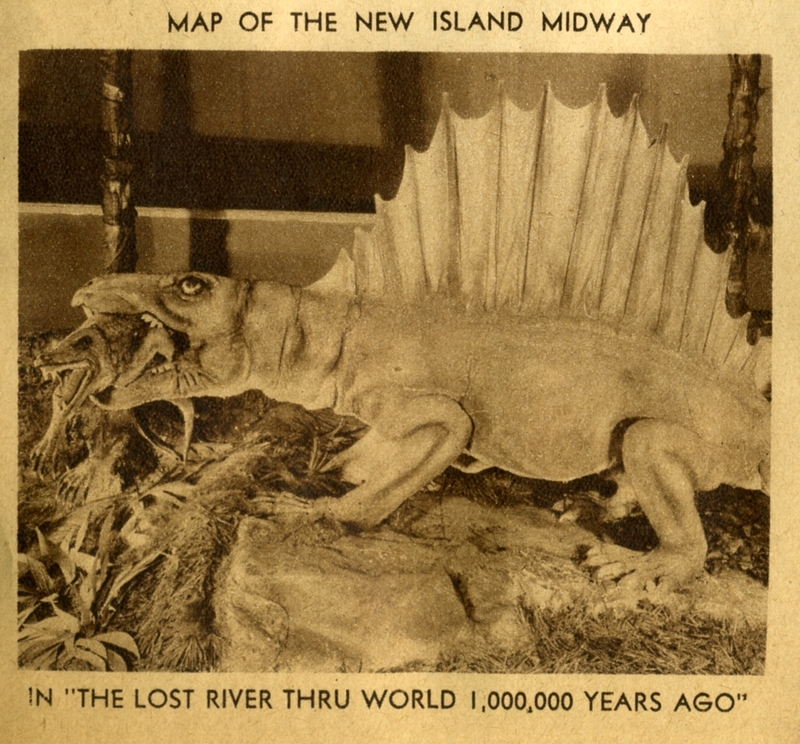 Our photo reference comes from the 1934 Chicago Daily News we’ve been mining for inspiration this summer. Meet Barney Oldfield – HELL DRIVER!!! Our art teacher comments that we made him into a comic book villain or vintage gangster. We did. Barney was probably a decent chap. 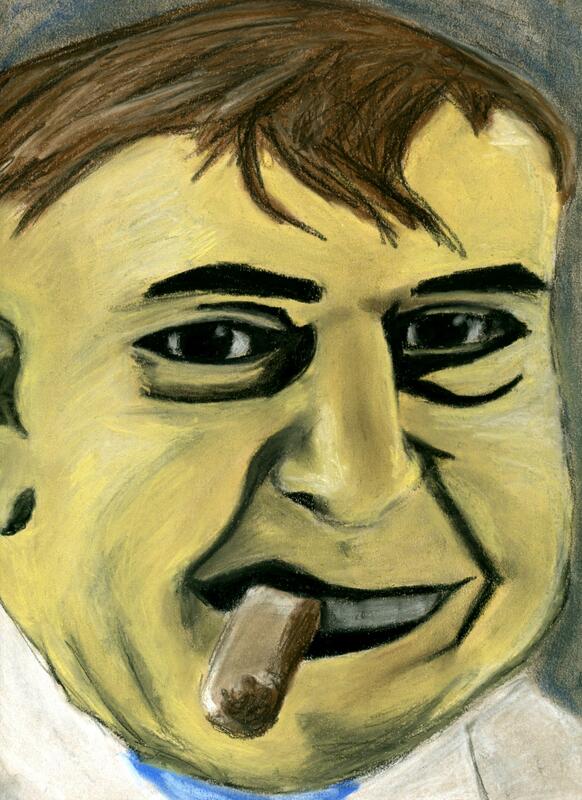 But, don’t you see something sinister about that cigar and his general expression? The way he’s leaning forward into your space just a little? Like maybe he’s a hell driver because he’s f$#%ing wasted on cheap Scotch all the time? Like maybe he leers at your wife as he loads the kids into the car for a hell ride? Imagine Barney hell driving to the horse races regularly. Maybe he has deep gambling debts to shady underworld figures which have sent him into hiding “on the road” as a transient hell driver. Who knows? 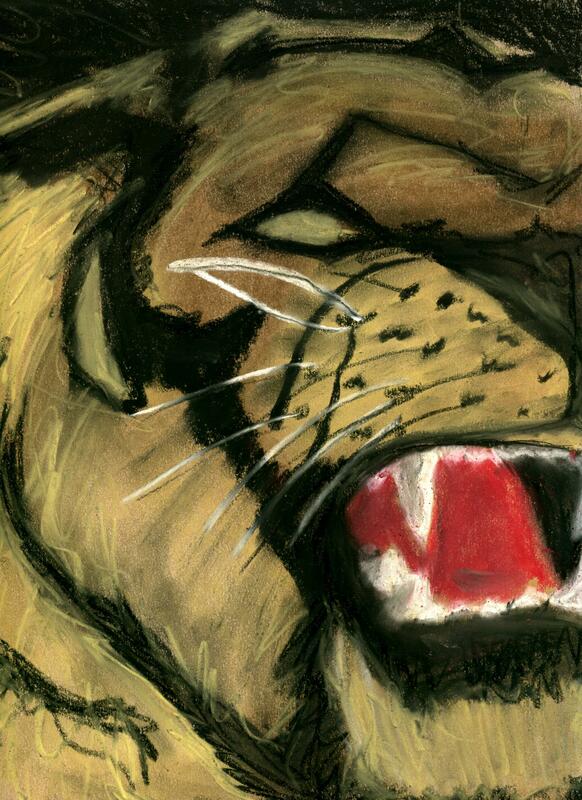 But it goes a long way in explaining why our portrait isn’t very flattering. We imagined all this backstory for Barney as we drew. It made him come out far more sinister than he probably really was. Something stood out, though, that one could use for entirely different inspirational themes: the eye of Horus. If you look at Barney’s left eye in the original photo – the right side of the page, from our POV – the shadows form a shape similar to the classic Egyptian symbol of the eye of Horus. Perhaps Barney wasn’t a hard-drinking gambling man leering at your wife. Maybe he was the incarnation of an Egyptian deity! UPDATE: Barney isn’t as entirely obscure as we believed. He was in the Tuscaloosa News Feb 28, 1935. 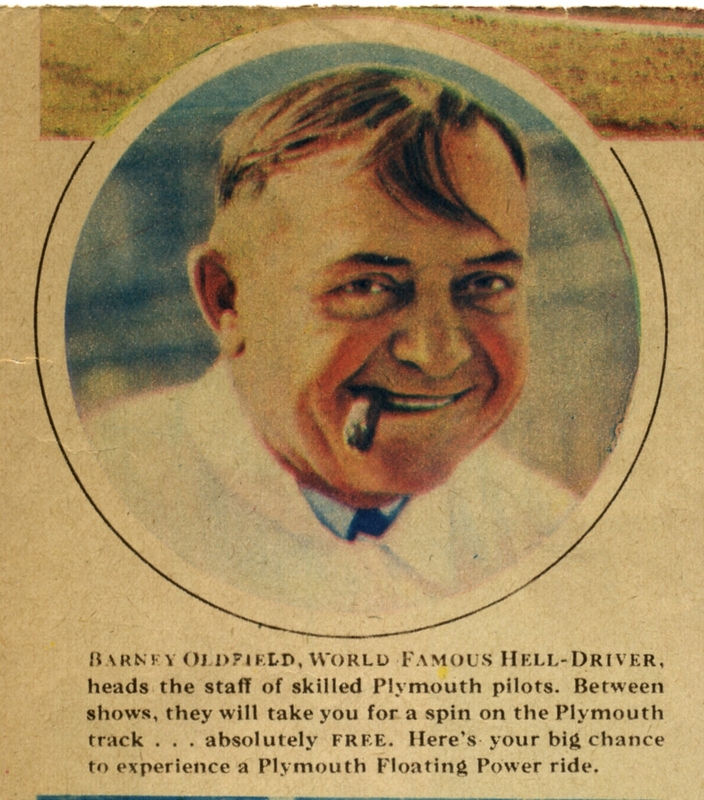 An ad shows he appears in two “thrilling educational interesting” motion pictures: “Hell Drivers” and “Four of a Kind.” The University of Illinois Chicago (UIC) has preserved a photograph of the racetrack at the Century of Progress International Exposition, along with details about Barney and his fellow drivers. Barney Oldfield also earns a mention as “world famous racecar driver and Chrysler spokesman” in a 2004 article about Ethel Miller. Ethel had the first Plymouth car ever built, and the article tells an interesting story about a publicity event where she would swap that Plymouth for the millionth one. All of which is fascinating. But, if you really want to get to know Barney Oldfield, enjoy Who the Hell Do You Think You Are – Barney Oldfield? at the JCS Group website, which contains a treasure trove of racing articles. According to that article, he would have been retired from professional racing and setting speed records (including a breath-taking 131.7 mph in 1910), and it was perhaps a less than happy time in his life. The article says he drank too much and lost his job barnstorming at county fairs. His trademark cigar in our reference photo turns out to be something he clenched in his teeth to buffer the vibrations of the car and engine so he wouldn’t chip them. Sounds like a pretty rowdy guy. Barney, glad to have met you! 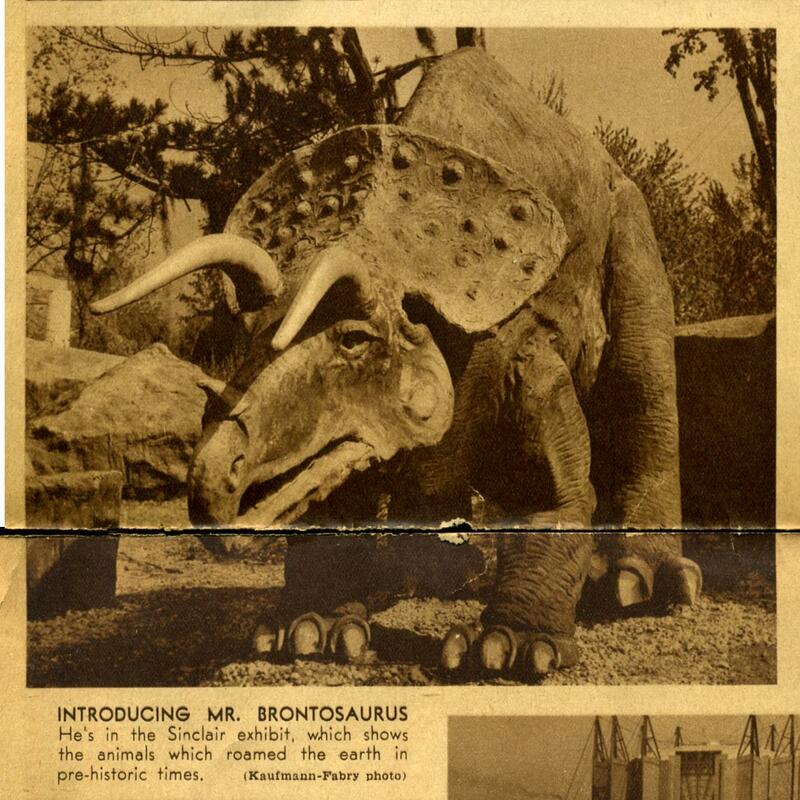 If we hadn’t ordered the Sinclair dinosaurs newspaper on eBay and the seller hadn’t randomly stuck newspapers in with your picture on them, we would have never known. Rock on, Hell Driver! 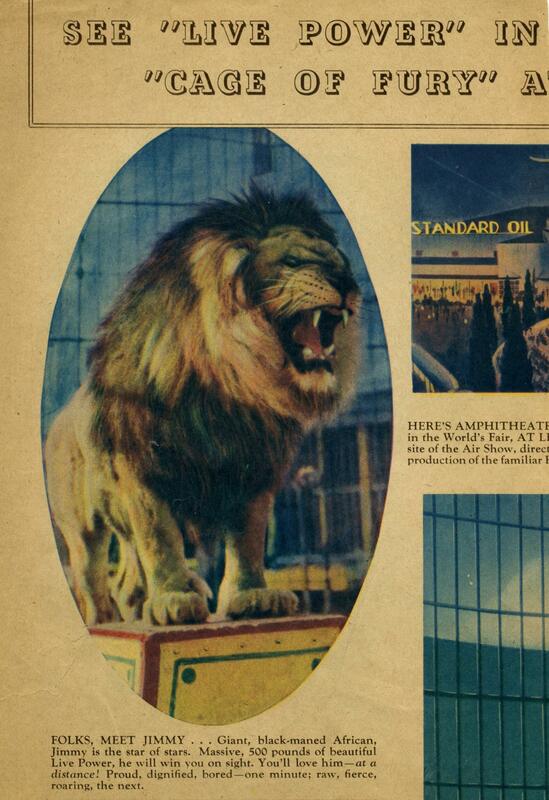 Our model lion is 79 years old now. We used his picture from the 1934 Chicago Daily News, shown below. Jimmy, they called him. “Jimmy” got ruined by over-aggressive spraying of sealant, so we reworked him. 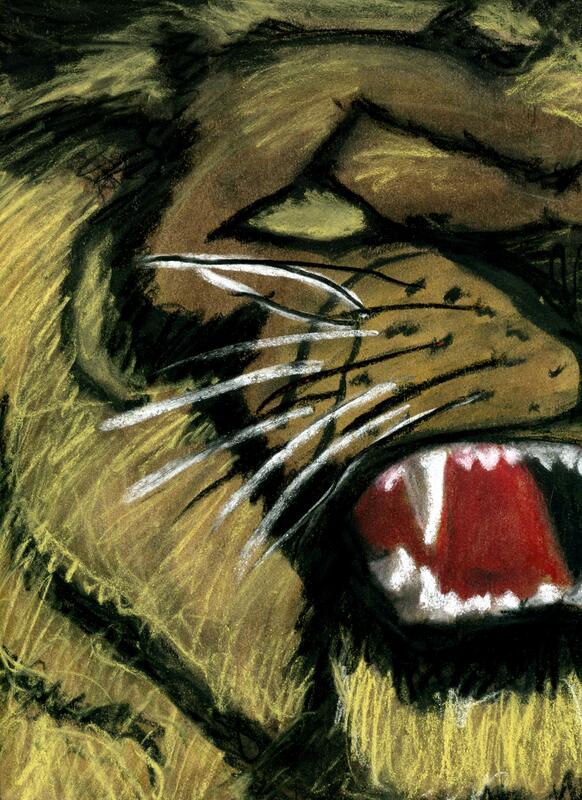 We kind of like the second version better, below.